Today’s guest blog comes from James Balm, Social Media Assistant for BioMed Central. Through my role at BioMed Central, I’ve spent time combining science and social media to deliver a message that is accessible to everyone. There’s one thing that makes my job all the more easy, and that’s the fact that all the research I promote is open access. But what is open access? Not all research can just be opened and freely read. In fact, a great deal of research papers have to be paid for by the reader in order to be accessed. Open access research helps us reach information without a paywall blocking the way. All open access papers are freely accessible, meaning we can read any papers we like. This is a fairly recent advance in the long history of publishing, but in combination with social media, it’s helping us to open up research to a wider audience. Research papers aren’t always the easiest pieces of literature to read. Expecting Joe Public to understand all of these articles is simply unrealistic. Whilst they have access to the papers when they’re open access, that doesn’t mean they’re always going to be able make good use of them. That’s where social media has its time to shine. More and more scientists are moving to social media in order to promote their research and engage the public, as well as each other. Social media in itself offers the chance to reach out and make science exciting. Social media helps unlock the ivory tower of academia, providing the opportunity for research to become a more public experience. Social media opens up science in a manner that we rarely experienced in the classroom. Now we are hearing from real experts; now we can all ask questions; now we can get involved. Social media opens the door wider, helping researchers reach the status of ‘highly accessed’. Blogs provide people with a more detailed explanation of research and findings with the help of visuals and engaging prose. Meanwhile, popular social media platforms, such as Facebook and Twitter, help bring approximately 25,000 visitors to our research papers per month. Through social media campaigns we are able to draw significant attention to research papers. 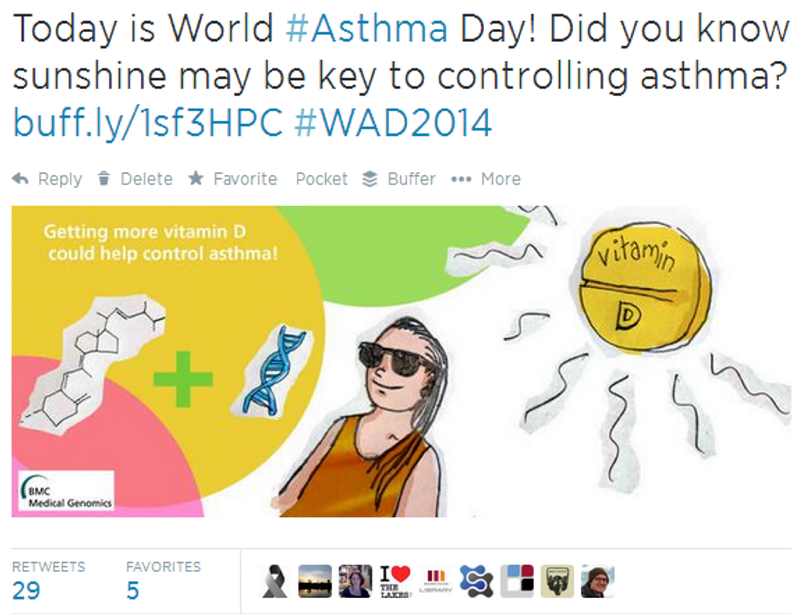 For example, with the help of illustrations and an awareness day, we were able to engage people with our asthma research on Twitter. Because of this campaign, we were able to help these asthma research articles reach ‘highly accessed’ status. Social media provides us with a the chance to engage with others and discuss important issues that affect the science community. Thanks to this, we are becoming more aware of the issues that face researchers, science, and reliability, such as transparency, peer review and registration of clinical trials. Social media can also help patients to find out more about their diseases and to discuss them with others. We are starting to see communities being established across the net dedicated to discussing diseases from breast cancer to Marfan’s syndrome. These are niche sites with a specialised following, where the ability to access research freely is a real benefit. People want to learn more about their illnesses and talk about new findings that may not be broad enough to reach mainstream news. Thanks to these communities, people are able to combat chronic diseases through improved health education. With open access, people are able to both share and read these articles. Not all these articles are guaranteed to be reliable. But social media is playing its part to fight this, with campaigns against misinformation. One example is the MS Society, who won an Association of Medical Research Charities award in 2011 for a social media campaign that countered a controversial paper about one potential cause of MS. The link was unproven and further studies were needed, but a vocal minority dominated online discussion. The MS Society responded by correcting misinformation without censorship. Furthermore, the information people share on the Internet about their illnesses and the effectiveness of drugs may be used by scientists. For example, patients with amyotrophic lateral sclerosis provided personal reports on PatientsLikeMe, a social networking site made especially for discussing illnesses, symptoms, and treatment. Research published in Nature Biotechnology concluded data taken from this site matched that of randomized trials, suggesting the Internet and social media could prove useful in ‘accelerating clinical discovery’. People can provide thoughts and perspectives on papers through all social media channels. One site of particular note is Reddit, which makes the most of open access research. With an audience of graduates, researchers, and PhD students, Reddit possesses a following of science-savvy users. With a selection of subreddits dedicated to subjects such as medicine, psychology, and science, you will also find a crowd of experts in these areas. Because Reddit is a self-moderated world, where users vote posts up or down, this makes the promotion of content much less biased. Users often offer their opinion on the research paper itself, evaluating its reliability and methods, rather than simply taking the news piece for gospel. In some ways, this behaviour resembles open peer review (where the reviewers comments appear alongside the published article). Indeed, all social media platforms offer the potential to discuss new research, its quality and validity, and these new ways of analysing papers post-publication seem to be influencing ideas about how we carry out peer review. Journals like F1000Research carry out peer review ‘post-publication’, while many of BioMed Central’s journals offer open peer review , and the chance to comment on articles after publication. All researchers should have access to research. 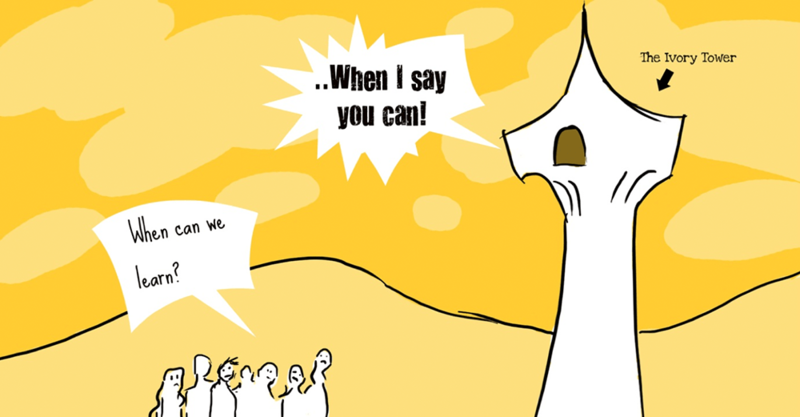 Research is there for other researchers to replicate or prove wrong, to comment on, and to build on. Each article forms the foundations of new discoveries, but with paywalls some off the key building blocks are missing. That’s why sites such as Academia.edu have gained such a great following recently. Academia is a social media site that allows researchers to network, and share and promote their research. The main aim is to help encourage the distribution of research within the scientific community, giving researchers more information about their area of interest. In short, open access and social media are helping both science and healthcare move forwards by educating others, providing communities for people to share and discuss science, and collating data. With one tweet and no paywalls, we can help research gain the visibility it deserves. James Balm is Social Media Assistant for BioMed Central. He writes regularly for the BioMed Central blog and you can also find him on Twitter – @justbalmy. For more information, feel free to follow BioMed Central’s @MedicalEvidence Twitter account. All in all, let’s have more open access and more open communication, but also let’s double our efforts to promote critical appraisal of research.